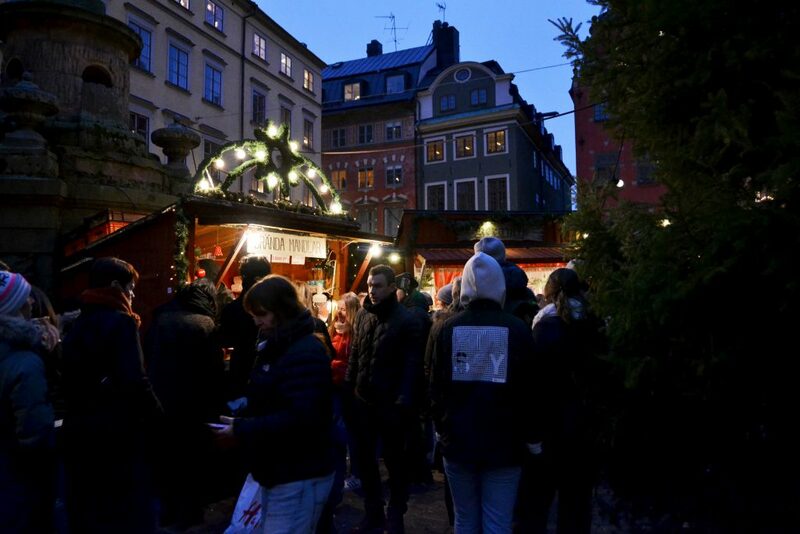 Today – a day before Swedish julafton – we’re culminating the Holiday Spirit Immersion Program by visiting the Christmas market that started it all. 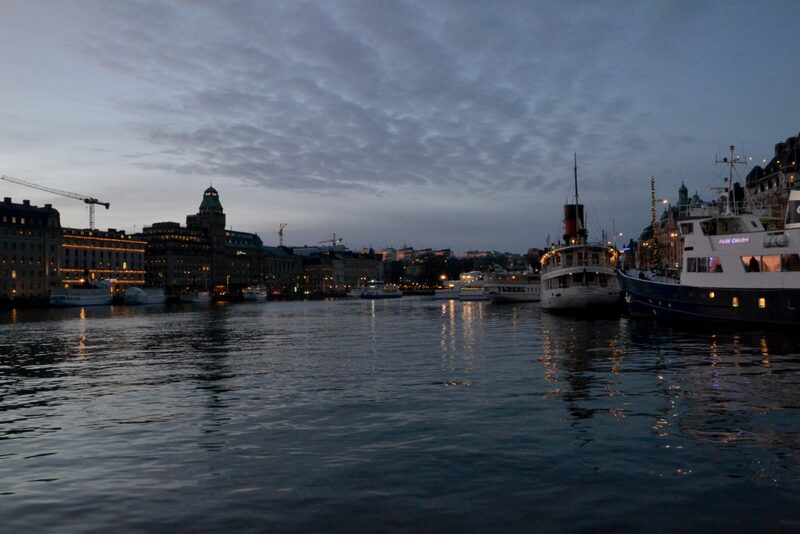 Just over 2 years ago, I visited Stockholm in mid-November to celebrate a friend’s birthday. We explored Sweden’s capital for nearly two days, and many hours were spent in the city’s Old Town (Gamla Stan). 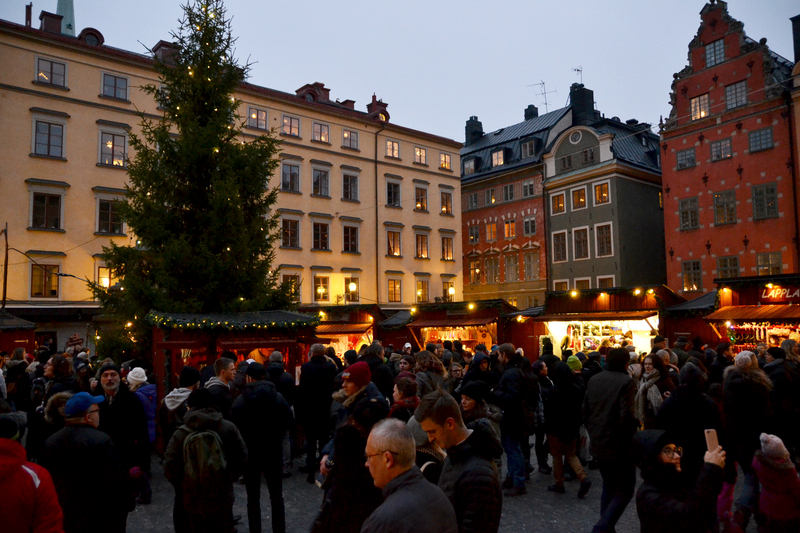 Every Advent, Gamla Stan‘s main square, Stortorget, becomes home to a cozy julmarknad (Christmas Market). 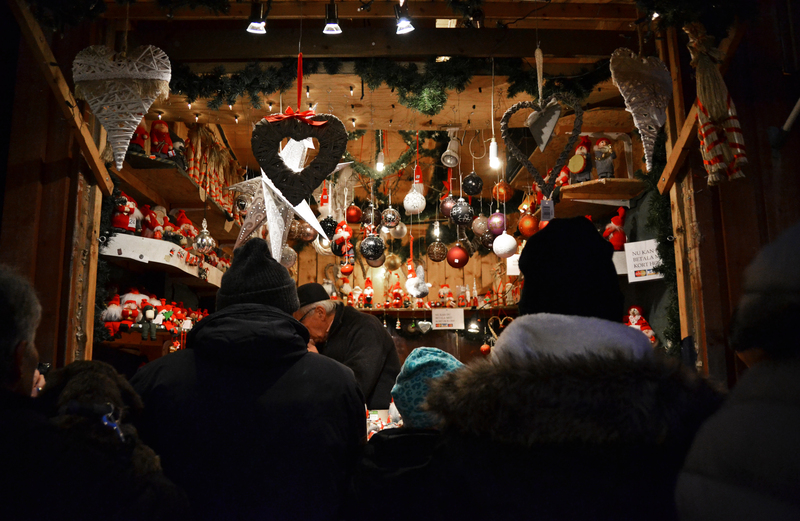 This holiday market was the very first European Christmas market I set foot it, and it is wholly responsible for starting my official Christmas Market obsession. Simply the cutest, rustic Christmas Market stall. Every year in Gamla Stan’s holiday market, around 40 red wooden huts are arranged to form tiny paths for market visitors to wander through. All stalls are adorned with evergreen wreaths and string lights. 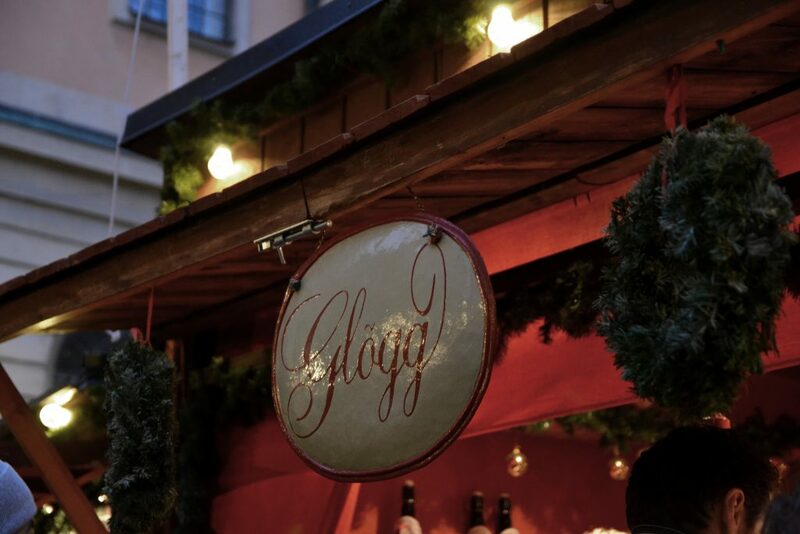 The aroma of glögg, (Swedish non-alcoholic mulled wine), waffles and toasted almonds fills Stortorget’s air. The rich colours of the old buildings surrounding the square only add to the market’s charm. During my visit two years ago, we indulged on steaming cups of glögg, waffles, and gingerbread – essential Swedish Julmarknad snacks. I re-visited the market during the fourth weekend of advent this year and did not skip out on feasting on these traditional Swedish Christmas Market goods. A collection of photos from the market. 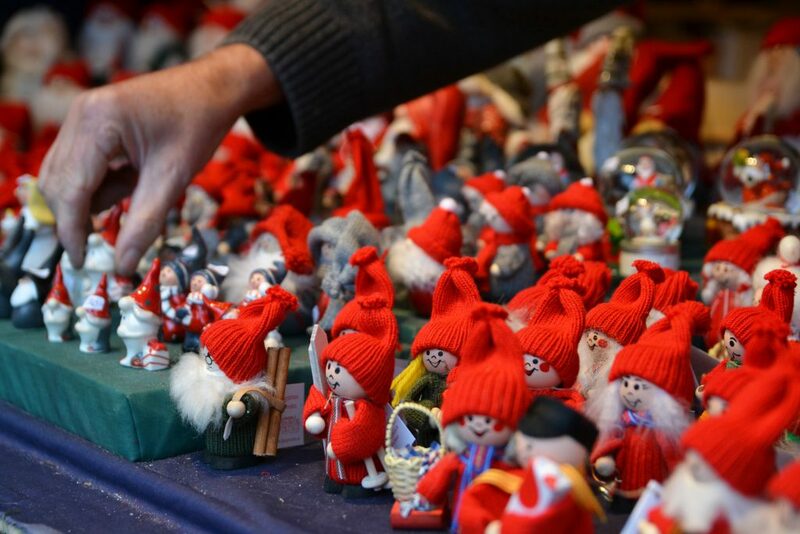 If you’re interested in learning more about Stockholm’s Old Town Christmas Market (and oldest Christmas Market), feel free to visit the Stockholm Guild’s page about the julmarknad by clicking here. The Stockholm Guild is responsible for running the market. It’s interesting and important to know that December is Sweden’s darkest month, and during this time of year, Stockholm receives roughly 6 hours of daylight (the sun sets before 3 pm). In order to combat the darkness, people throughout the country decorate their windowsills with star-shaped lamps and electric candlesticks. 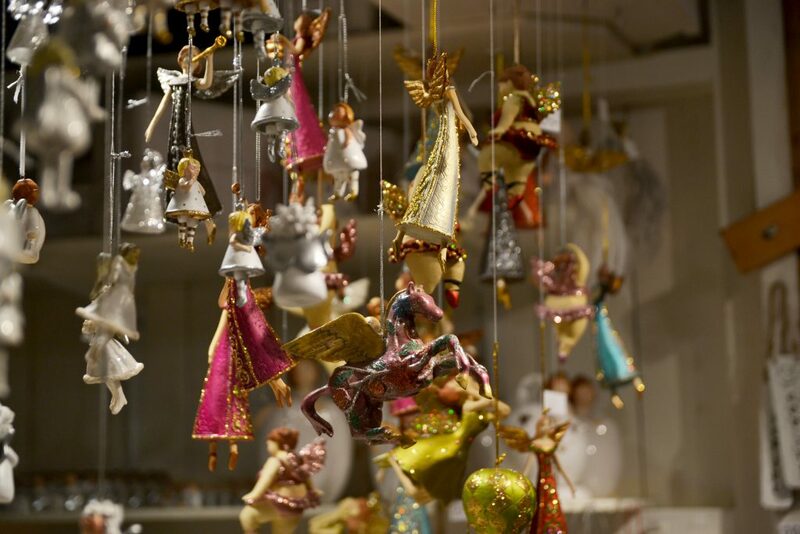 The windowsills in the buildings surrounding Gamla Stan’s Christmas Market are not exempt from this tradition. The glowing windows create an even cozier atmosphere in the market – especially as darkness falls. Just look at the inviting, luminous windows. 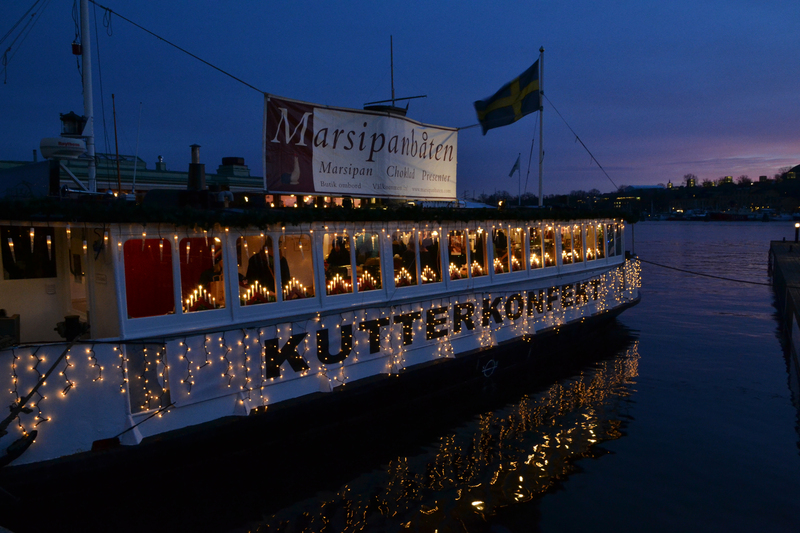 Stockholm’s Holiday Spirit Immersion Program doesn’t end here. During advent, many of the city’s “more contemporary” downtown neighbourhoods dress up for the occasion too. Drottningatan, a pedestrian-only shopping street connected to the Old Town, is illuminated with thousands of Christmas lights. Bibliotekstan, Stockholm’s high-end district, doesn’t hold back and boasts many lights and wreaths as well. Christmas carols also fill Bibliotekstan‘s streets during daytime hours. Biblioteksgatan in Biobliotekstan – A little reminiscent of London. If you’re interested in viewing some unique yet festive sights, don’t consider your explorations of Stockholm at Christmastime over just yet. Make sure to take a walk along the waterfront by Strandvägen from Berzelii Park towards Djurgården Island. You’ll find that many docked boats are ready for the holidays too. 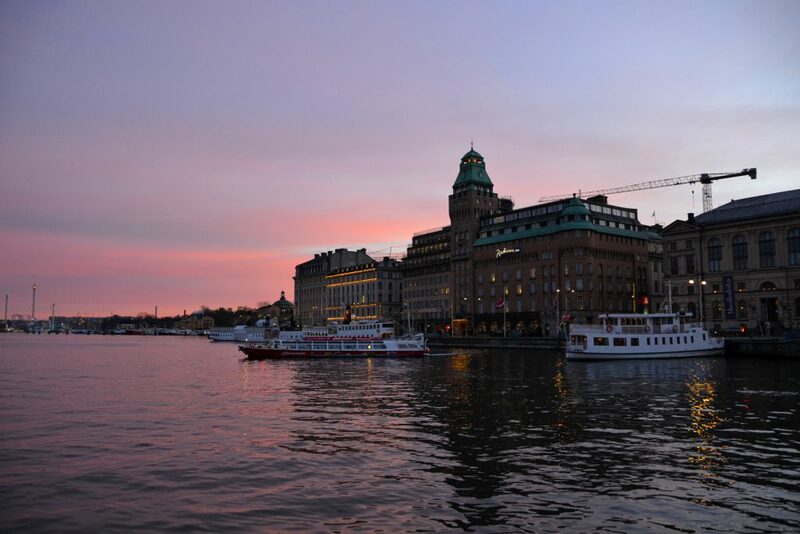 Sunset is an exceptional time to pay a visit to this area of Stockholm. Take a look at the photos below and tell me whether or not you agree. Decorated shops in boats and a festive harbour. 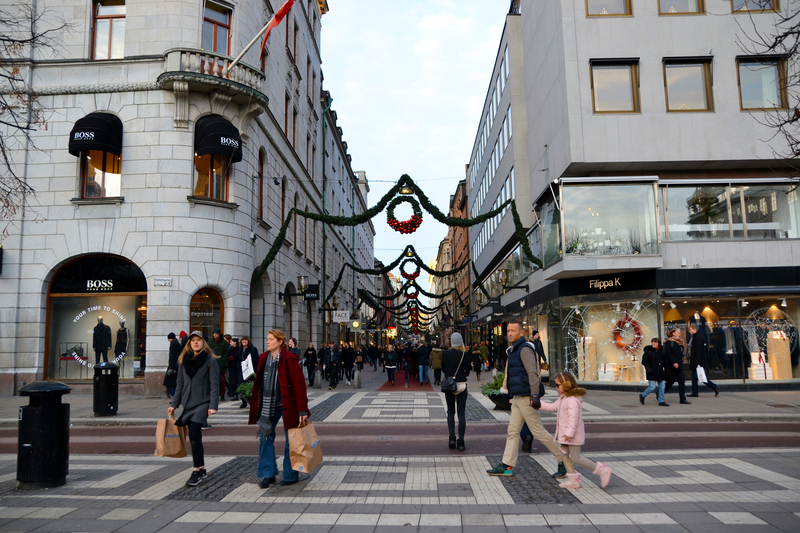 Christmastime is Stockholm is a wonderful time of year. I would almost call it the most wonderful time of year in the city, but I have to acknowledge that Stockholm offers fantastic experiences and adventures during all four seasons. 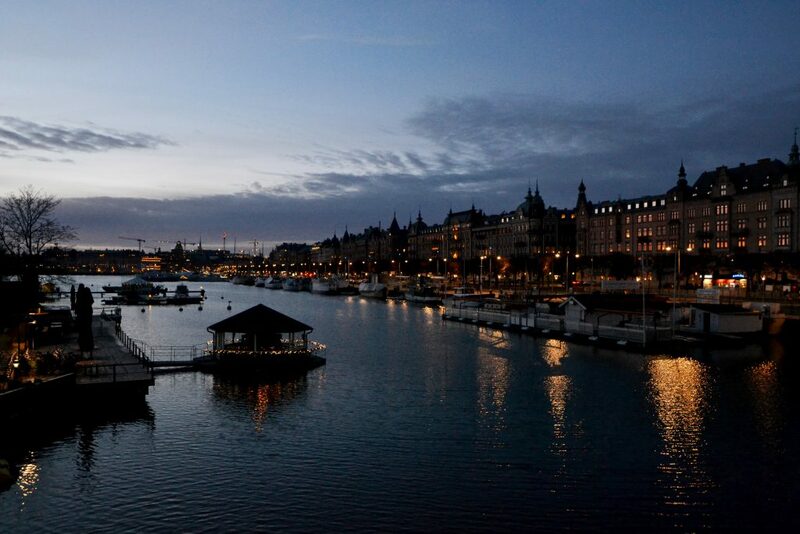 Therefore, you can definitely expect more comprehensive posts about Stockholm to be published in the future! To wrap this post up, I want to honour the 2.5 years I’ve spent in Sweden and my love for the Swedish language. Unfortunately, when it comes down to it, my Swedish is still rather broken, (since I only use English at work). I am only capable of producing doge-quality phrases when trying to convey my impressions of Advent in Stockholm. Nevertheless, I still want to share my attempt at Swedish purely for its entertainment value. God Jul Allihopa! Puss och Kram! 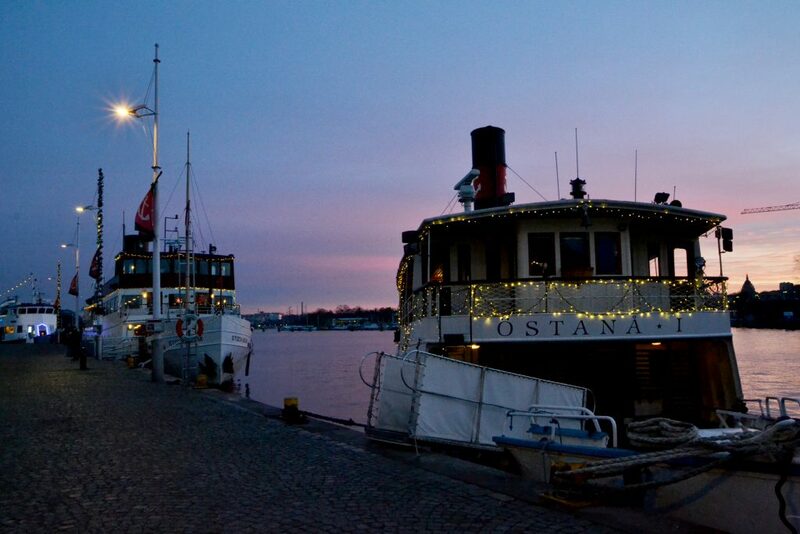 Stockholm looks beautiful at Christmas! I’d love to experience it one day.